All on 4 implants sedation is the most practical way to permanently replace a full upper or full lower set of teeth. Our local sedative dentist can sedate you for All on 4 tooth implants at our location in Burtonsville near Silver Spring, Clarksville and Columbia Maryland. All on four is a permanent full mouth implant option that stays in the mouth and does not need to be removed. While the solution is called “All on 4”, it is better to use 5-6 implants to properly support all full set of implant teeth. Four implants are not strong enough to replace 12-14 natural teeth. Furthermore, if one of the implants does not work, the patient and implant doctor may waste a lot of time and money. 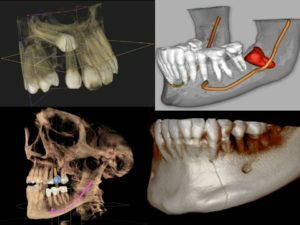 We use the latest technology for a full 3D Cone Beam scan of your jaws to determine what you need to receive a new smile with All on 4 implants sedation. The system uses minimal radiation and only takes 14 seconds. The scan is taken in the open room where you are comfortably seated. No laying down or closed and tight spaces. We are convenient to Silver Spring, Burtonsville, Columbia, Clarksville Maryland and all of Montgomery County and parts of Howard and Princes Georges counties Maryland. How much does All on 4 Implant Sedation Cost? 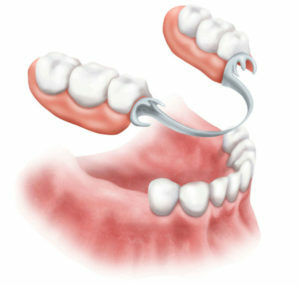 All patients will save $3000 – $8000 since we compete the procedure entirely in our sedation implant center. The cost of All on 4 implants depends on the solution you choose. We have acrylic teeth and zirconia teeth. The cost also depends on how many teeth need to be removed and how much gum and bone grafting needs to be done. For your convenience, we will take your 3D cone beam scan and provide a complete treatment plan cost for your All on four implant case. The service comes at no cost to you and is complimentary. If you have insurance we will bill your insurance for the Xray and exam. If you do not have dental insurance, there is no fee. Care Credit can do financing and payment plans for All on 4 implant procedures. Visit their website to apply. For patients traveling from out of town, we recommend using Reagan National Airport in DC or BWI in Baltimore. There are plenty of hotels near Burtonsville, Silver Spring and Columbia Maryland on Hotels.com. First, you will meet Dr. Adams, our sedation dentist, who will put you to sleep with intravenous dental sedatives such as midazolam and fentanyl. We will remove All remaining teeth to be replaced. 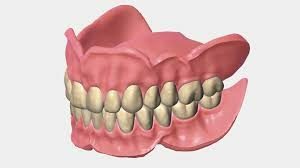 For example, if we are doing All on 4 dental implants sedation to permanently replace all the upper teeth, any remaining teeth will be removed. 12 week healing period for gum and bone to grow and attach to the implants and for the tooth extraction sites to heal. 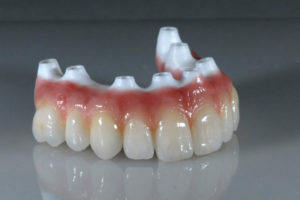 Impression of All on 4 dental implant permanent full upper implant bridge. Delivery of final All on 4 permanent implant teeth. Does Insurance Pay for All on four sedation and Implant Surgery? We will bill all PPO and traditional insurances and many will pay for a portion of the procedure. The best thing to do is contact our office and we will contact your insurance to help you determine what they will pay. This will be done typically at the time you come in for your 3D cone beam scan and consultation.